1) Baraka Obama pardons all his Czars and Cabinet officials. 2) The Republican Congress calls each and every pardoned person to testify. 3a) The pardoned people refuse to testify. 4a) Congress hits them with Contempt of Congress and Obstruction of Justice charges. 3b) The pardoned people lie to protect the agenda. 4b) Congress hits them with Perjury charges. 5) Obama’s peeps are thrown in jail for crimes committed after their pardons. 6) Obama is implicated for crimes he committed, due to evidence found in the questioning and trials of his peeps. 7) Obama faces criminal charges, including treason and other high crimes and misdemeanors. No, Obama would not be a wise tyrant and narcissist if he pardoned his peeps. It would be better for Obama to not pardon anyone in his circle. That way, his peeps could exercise their Fifth Amendment rights, found in a document they despise, so they wouldn’t go to prison; thereby, insulating him from the prison he deserves. His best chance to avoid what he deserves is to guarantee everyone around him will get what they deserve if he gets his. In an update to the Alton Nolen story, we have his mother’s assurance that it was not him, or the real him, that was there when this thing “happened”. He was raised in a loving home, you see. And Mom says, he believed in God. Though that is not quite what is at issue: since no one disputes that Alton Nolen believed in a god of some sort; just not the Christian God his mother and sister appear to – sincerely – profess. No, the god Alton Nolen professed was the god Muslim faithful refer to as “Allah”. 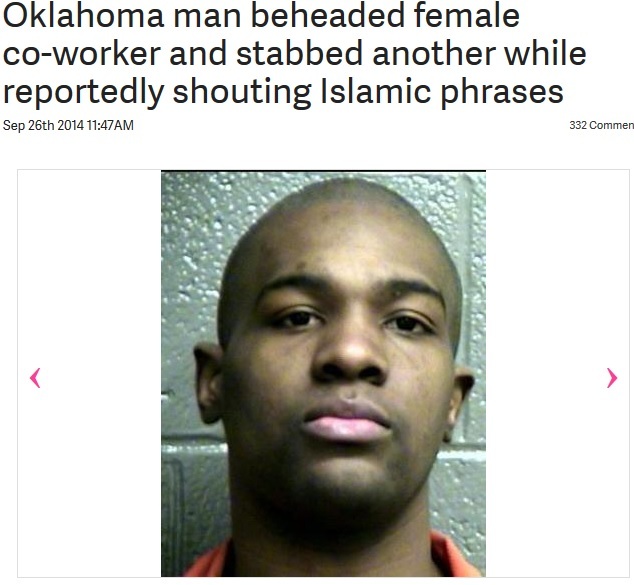 And it was apparently Alton Nolen’s belief in Allah and in the Koran as the word of Allah, that led Nolen to argue that women should be stoned for certain offenses, and is probably why he beheaded the woman he chose as one of his slashing victims. But you know, Alton’s mom is, perhaps understandably, having a hard time dealing with this. “Relatives of the main suspect in an Oklahoma workplace beheading insist that he is a good person and would never hurt anyone. 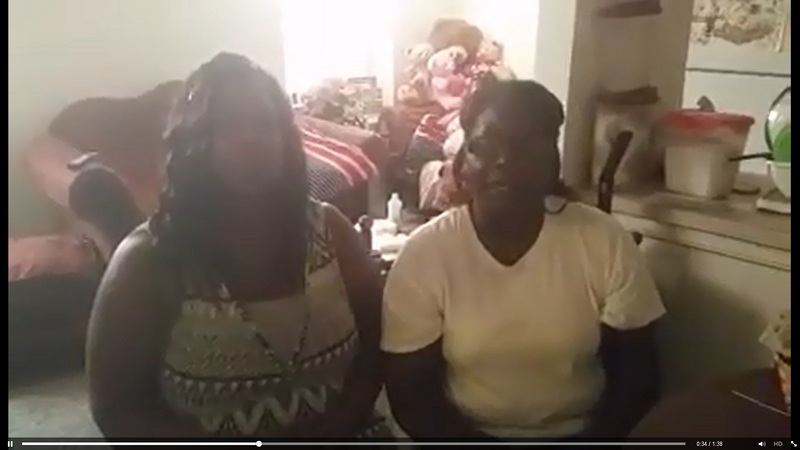 Mother Joyce Nolen and sister Megan Nolen made the emotional claims in a video posted Saturday to Facebook. Accused killer Alton Nolen has a violent criminal past and has spent multiple stints in prison, records have shown. Uh, I know my son, my son was raised up in a lovin home. My son was raised up believing in God, that’s what he believed in. My son was a good kid. You know, I know what they saying he done, but I’m gonna tell you this; that’s not my son. There’s two sides to every story. And, we’re only hearing one. His family, our hearts bleed right now, because what they saying Alton has done. I wanta apologize to both families, because this is not Alton. But I just … I’m praying that justice will prevail; the whole story will come out; the whole story. Yeah, Alton was a good kid. Probably no “serious felonies” as they say in Ferguson. Their hearts are bleeding too, figuratively speaking. Almost as much as the decapitated body of Alton’s victim did literally. But remember! The whole story has not come out! Who are we to judge his acts before “the other side” ( whatever that might be) is heard? Now, as regards Alton’s assaults on police officers? The prison time? He was a good kid, done wrong. Fired. Driven to act out in a way contrary to his loving God believing nature and upbringing. Guest Posting from: The Progressive Center for Liberal-Islamic Solidarity and Sharia Justice. “You have all seen this picture. It is not the same picture we see! Yes, so you say a woman was slaughtered with a knife, being decapitated in fact. So you say the Muslim man who did this was caught in the process of attempting to slaughter another. So you say he was shouting Islamic slogans as he engaged in this activity. What’s any of that prove? How can we Progressives who stand in solidarity with the oppressed and ignored of the world expect anything less, in this, a country so rife with injustice and bigotry and white hetero-normative privilege? Was it because of his religion? Was it because he was black? Imagining for a moment that there is some shred of truth to the corporate media line: Did he not pause even long enough to receive a fair warning? Were others proven to be in immanent danger of being harmed? How do those who say so, claim to know for sure? Can their bigotry give them the power of reading minds? What exactly has the alleged killing of one person, got to do with leveling lethal force against Alton Nolen when we do not yet know if there were any witnesses to the alleged first killing? Why was Alton Nolen then made the repeated victim of potentially lethal force, when it has not even been proven that he intended to kill the one person with whom he was actually (and allegedly) witnessed to be in a tussle with? What right had some uninvolved third party to interfere in this dispute and then to level potentially fatal violence against Alton, when they could not possibly have known what led to the altercation in the first place, and whether his actions in allegedly striking back against the power, were undoubtedly justified? Instead Alton was ruthlessly gunned down … shot three times when he was virtually unarmed in comparison to a trigger happy corporate lackey with a rifle!!! Alton had only, allegedly, a knife. The so-called knife was not even his own according to the initial reports. It was owned by the CORPORATION! We suspect that what we have here is another instance of some rent-a-cop taking advantage of a power imbalance in order to lash out and victimize a person of color and a member of a maligned religious group, just because he was able to do so. We demand information on exactly who the shooter was, and why he was armed in the first place! We demand to know who his parents are and where his wife and children live! Who gave the would-be murderer of Alton Nolen a rifle? Who told him he was allowed to shoot Black men and Muslims? What right had the gunman to assume that the first (and remember it is only alleged) “beheading” was the work of Alton, and that the altercation which he did witness was not merely Alton defending himself, while uttering sacred prayers for deliverance, against an insufferable systemic provocation and disrespect? Was the shooter even properly trained and licensed? Has he any indications in his background that he might be prejudiced against Muslims? WHY … why we demand to know, did he shoot three times?!!! Was not one shot tearing into the helpless body of this poor, marginalized victim of capitalism, racism, and western imperialism not enough? The above opinion does not necessarily reflect the views of Truth Before Dishonor, its writers, contributors, employees, nor any sane person in the universe. On September 10, 1989, my second daughter, Audréy Renée-Maree Hitchcock died after three weeks of life. She did not die of natural causes. She did not die due to anything resembling an accident. But she died, at three weeks old. I posted the above almost five years ago to the day. If you want to know more about this, you’ll have to ask my ex-wife. She was in the room at the time the trauma occurred. I was asleep in an adjoining room at that time. If you’re going to falsely accuse someone of pedophilia, you might not want your IP randomizer to point to a nation which is protecting a notorious criminal who drugged and then anally raped a child. Just a thought. This message brought as a PSA to the noted anti-Semite whose IP randomizer seems to be heavily centered on Europe. I am at this moment in a hotel room, getting ready to head off to the airport for my three week overseas trip. But just getting here was an ordeal and a half. The company I am contracted to has known I needed to be in Salt Lake City by the 13th or 14th so I can catch my flight on the 15th for 2 months. And I kept training students right up to the end (a break in training of 45 days or more means I would have to go through the 4-day training class all over again). My last student found my truck in the shop 5 times in 5 weeks, one of those times being his fault. I had nox sensor issues more than once, a clutch replaced, a fuel pump replaced, a cylinder liner replaced, and a brand new 1200 dollar super-single drive tire replaced with another brand new 1200 dollar tire (his fault). On August 6, I was in California. I delivered a load to Carson, then went over to Colton to pick up my next load, headed to Shelbyville, Tennessee. The load was to pick up between 10am and 11pm on the 6th, so I arrived at 5am and waited. And waited. And waited some more. It wasn’t ready at 10am like it was supposed to be, then at 1pm I was informed a stop in Ochelaka, Oklahoma was added. It was finally ready to go at 7pm. The delivery times of 3am on the 8th for OK and 3am on the 9th for TN got changed. New delivery times were 630am on the 9th and 3am on the 10th. And I got time to go into the shop at the Petro to get my drive tire replaced. My student had dropped a trailer and pulled out from under it, like is done 120 times a year. Only he didn’t lower the landing gear far enough, and he pulled out real fast without stopping midway to assure things were good. The trailer dropped down onto the drive tire, and since he was pulling out too fast, the truck came right out, shredding the tread on one 1200 dollar super-single drive tire. All the way around the tire. I got load assignments to pick up a load on the morning of the 10th to deliver to Haverhill, Massachusetts the morning of the 11th and pick up a load in the Boston area 3pm on the 11th to be delivered to Ogden, UT on the 13th. After delivering in OK, my Shelbyville delivery time for the 10th got changed to 720am, meaning I would be late to pick up in Murfreesboro, late to deliver to Haverhill, late to pick up in the Boston area. So I go pick up my load in Murfreesboro. And lo and behold, the yard jockey had backed the trailer up too far. He pushed the trailer tires against a large concrete back-stop, pinning the mudflap between the back-stop and the tire. And when he dropped the trailer, he tore off the mudflap and bent the bracket. I was going to have to go out-of-route to Nashville to get the damage repaired. But first, it being a heavy load, I had to get the truck scaled out. And there was a long line inside the truckstop waiting for the scale ticket. And then the scale ticket. 30,000 on the drives and 36,600 on the trailer. 34,000 maximum. So back out, stretch the trailer tandems as long as legally possible. Rescale. 32,000 on the drives, 34,600 on the trailer. Overweight. Back to the shipper to rework the load. Over an hour lost at the truckstop. Two hours lost at the shipper. Then back to the truckstop to scale it out, and it’s legal this time. So next we go to the TA to get the mudflap hanger straightened and a new mudflap installed. 40 miles out of route, and 3 hours wait time. And we’re finally ready to roll on to Haverhill, MA. Shortly after leaving Nashville on I-40, a man with white hair and a short-cropped white beard walked toward the highway so my student moved into the left lane and slowed down. The man continued walking out onto the 70 mph highway, and then he really did it. He threw something that looked like a brick at my windshield! He missed, hitting my mirror mount and barely hitting the lower seal around the passenger mirror. Instead of delivering in Haverhill at 4am on the 11th, it looked like a 5pm delivery. My load out of Boston to Ogden got pulled off me. Now, I had a delivery in Northeast Massachusetts for the evening of the 11th with nothing getting to Utah. And a flight and hotel room I already paid for on the line. But my Dispatch Manager pulled through. I had an 11pm pick up in Middletown, Connecticut to be delivered to Salt Lake City 11pm on the 13th. So, we get stuck behind a crash on I-78 on the Pennsylvania/New Jersey border. Then we get stuck behind a crash on I-287 in New York. Then we get stuck in a 7 mile back-up behind a crash on I-95 in Connecticut. Then we get stuck in a back-up on I-290 in Massachusetts. We finally get delivered in Haverhill at 930pm, when it was supposed to be delivered at 4am. Now, off to the Connecticut pick-up. And… we get stuck in an hour-long back-up on I-90 in Massachusetts. And a midnight pick-up. Other than unseasonable cold and unusual rain where it doesn’t normally in the summer, the trip to Salt Lake City was uneventful. Finally, I could relax. Wisconsin, known as “The birthplace of Progressivism” (view with a grain of salt), had recall elections that didn’t work out so well for Democrats after Governor Walker and the Republicans passed sweeping reforms that severely cut into the slush money Public Employee Unions (and their off-shoots) got out of their subjects — reforms the Democrats tried to stop by fleeing the state instead of doing their jobs. Then came the highly partisan, highly secretive, highly unconstitutional, highly intimidating raids and political rectal exams of Conservative groups fighting the Leftist recall attempts and Leftist big money (which have never been investigated). Followed by Conservative legal pushback to protect the rights of all individuals from Fascist tyranny. And the Democrat prosecutors, not used to having to defend their heavy-handed partisan intimidation tactics, are losing court battles and not liking it one bit. O’Keefe and his Wisconsin Club for Growth have turned their civil rights lawsuit — a complaint many legal experts believed would be an uphill battle at best — into ground-breaking litigation to be reckoned with. It certainly has demanded the attention of John Doe prosecutors turned defendants: Milwaukee County District Attorney John Chisholm, the Democrat who launched the secret probe into dozens of conservative organizations in the summer of 2012; two of Chisholm’s assistant DAs; John Doe special prosecutor Francis Schmitz; and Dean Nickel, a shadowy investigator contracted by the state Government Accountability Board. Some say the prosecutors, not used to being on the defensive, are sounding a little nervous these days, maybe even hostile. Their filings in federal court of late come across as condescending, and testy. Who could blame them? There’s much at stake for Chisholm and crew – beyond the forced termination of the probe they’ve pushed for nearly two years. In comes Wisconsin’s Attorney General, who has declared that, according to State Law, the Government Accountability Board doesn’t have to be accountable to the general public. Orwellian barely covers what Wisconsin’s law, written by Progressives, does to actual word definitions. MADISON, Wis. — It appears the state Government Accountability Board will be able to keep its secrets from the public eye. Now the leaders of the Legislature’s audit committee say they might change the law to open up the records. The Legislature has provided specific authorizations of confidential information in other circumstances, Van Hollen wrote, but the audit bureau’s right to access documents under Wisconsin statute only provides a “general right” access, and no specific authorization to access confidential records. So, according to Wisconsin’s Attorney General, Wisconsin law states that the Government Accountability Board is not accountable to the Legislative Audit Bureau or the people who elect their government officials. Once the Federal judge who demanded the total destruction of the material unconstitutionally taken in hyper-partisan raids finds out the GAB is not releasing information, he’s going to have something to say about that. This is Progressivism trying to hang onto its Fascist tyranny and avoid being accountable for its wholly unconstitutional intimidation of all who stand against Government Control of everything. For more information of who was involved in the protests, including information destroying the Leftists’ Godwinning of Walker and Republicans, see Restoring Honor Now. Also read the 96 articles (so far) by Watchdog.org in this surreal unfolding tale of overreaching government and pushback by regular citizens. Can we at least try enforcing the laws already on the books before we go about violating the Second Amendment? Hmmm? When you catch a violent felon violating gun laws by having one, and then let him go, this happens. He wouldn’t have kidnapped that teen-aged girl, raped her, tortured her, tied her up, imprisoned her, poured gasoline on her, and tried to set her on fire if you Leftists hadn’t released him from prison early. This one, as usual, is on you! I contributed to help make the Gosnell movie happen. You can, too. Go to www.gosnellmovie.com and you can help make an important movie happen. Hot Air has some important news about who is blocking the attempt to crowdfund, and two actors who have made youtube videos in support of the crowdfunding. Edit: For those who have not heard of the heinous mass murderer Kermit Gosnell (and mainstream media and Hollywood like it that way), read what I wrote and Dana wrote back in 2011. Fair warning: have a strong stomach (preferably empty).